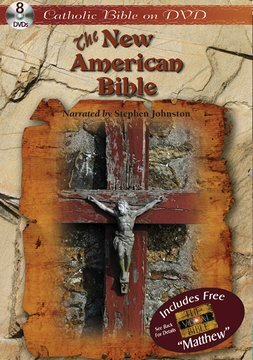 On sixty-six (66) high quality compact discs, Eric Martin narrates this popular non-dramatized version of the New American Bible on audio CD. This NAB translation is the achievement of some fifty biblical scholars. These Catholic scholars have approached more closely than ever before the sense of what the sacred authors actually wrote. From the original and oldest available texts of the sacred books, with a better understanding of Hebrew and Greek and the science of textual criticism, and with the fruits of patient study, these translators and editors have developed this contemporary version that is sure to respond to the need of the church in America today. The narrator, Eric Martin, has worked as a journalist, narrator, actor, writer, and radio broadcaster, and has received National and International honors in the field of narration. With over 80 hours of narration and synchronized on-screen graphics and text, the NAB New & Old Testaments on DVD features Emmy Award0winning narrator Stephen Johnson. His crystal clear mellow baritone voice provides distinct pronunciation, and makes the Scriptures come alive in an easy-to-understand style. Also included..... Free Visual Bible Matthew 2-DVD Set! 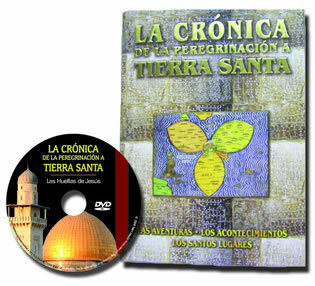 (Coffee Table Book) with DVD "Las Huellas de Jesus"
Depicting the historic events of the past 2000+ years, "La Cronica de la Peregrinacion a Tierra Santa," (The Chronicle of Pilgrimage to the Holy Land) is a spectacular album (9-1/2" x 13" hardback, oversized coffee table book) featuring 256 chromo pages with over 1100 color photographs. As the story unfolds, you find yourself experiencing history and undertaking the spiritual rite of Pilgrimage to the Holy Land. Also, included is the DVD, " Las Huellas de Jesus," (The Footsteps of Jesus) a stunning journey and personal, narrated, pilgrimage to the holy sities in Israel that follows the steps of Jesus, from his birth in Bethlehem to Nazareth, Galilee, Jerusalem, and so much more! Translated from the Latin Vulgate. 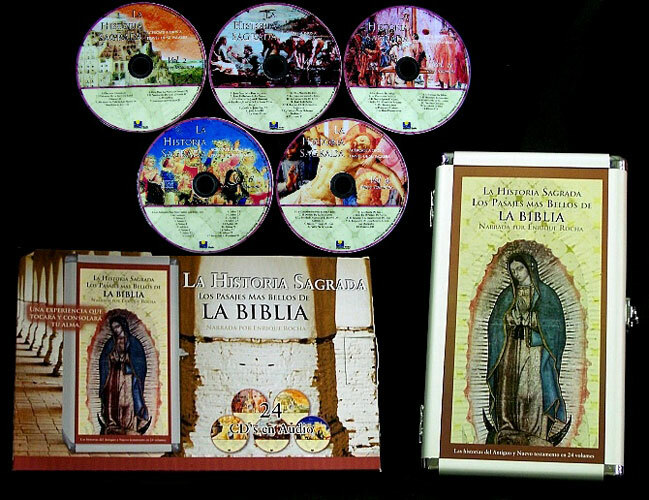 Nueva Edici n Guadalupana Para Estudio (Holy Bible - New Guadalupana Study Edition) Translated from the Latin Vulgate. 1950 edition. Main points of Scripture match the Douay Rheims translation. 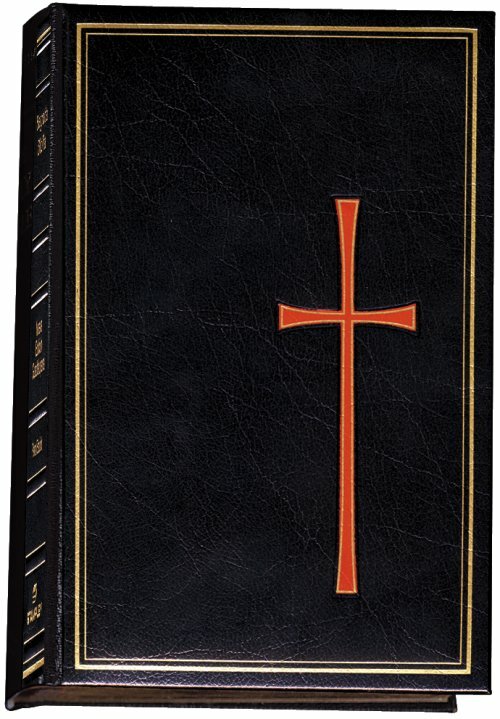 Black bonded leather, gold edges, embossed cover. 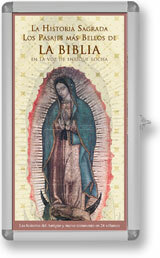 Deluxe Catholic Spanish study Bible in hand-sized edition. The traditional Felix Torres Amat text is featured in an easy-to-use size for Bible study at home and at church. An extremely legible type-setting on high quality Bible paper helps make this one of the most popular Bible editions ever. Additional features include an Imprimatur, gilding on all page edges, a marker ribbon, and a full color presentation page. Color pages bring to life important Catholic shrines, the 15 Traditional Mysteries of the Rosary and the Stations of the Cross.